Well, it is that time of year again! Stink bugs are highly visible in the fall as they look for ways into your home to survive the cold winter. As the days get shorter and cooler, stink bugs naturally look for a warm spot to overwinter. During the fall, you will often see them sunbathing on the sides of your home. They can sense the warmth escaping through the walls of your home, through cracks and crevices around windows or doors, or around chimneys, eves, and roof-lines. It is these vulnerable areas that they invade your home from Sept – Nov. Once inside, they look to overwinter inside insulated walls or attic places. The Rescue sting bug trap is a very effective solution for capturing stink bugs in the late summer and early fall. Although, as the fall progresses these traps loose their effectiveness because stink bugs are no longer looking for a food source (the lure for the trap) and are more interested in finding a way to stay warm through the winter. You can use this during the fall, but if activity diminishes around the trap, you will want to consider alternatives, such as sprays and indoor traps. Harris’s stink bug killer is a water-based insect control that can be used on most any surface, except for edible plants. 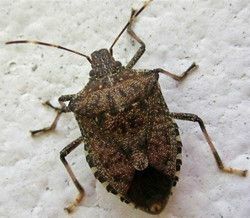 Spraying your window trim and other areas where you notice stink bugs on the outside of your home is a quick way to eradicate large infestations of stink bugs. Because stink bugs have a “shield” that protects them from the back, they can be a little difficult to kill with insect sprays, but the goal here is to apply the spray on surfaces that you know they will contact or areas that they will try to enter your home. You can even spot shoot bugs and spray them directly – however do not expect them to die on the spot. Even though the active ingredient has made contact with the stink bug, it must dry completely before it can start to paralyze the bug and destroy it’s nervous system. You will want to reapply every couple of weeks to keep the active ingredient in full effect. Safe to apply both indoors and outdoors around your windows and doors. Once stink bugs find their way indoors, they become harder to trap but for problem areas, we have several different options that will reduce their annoyance. Rescue’s stink bug trap with light attachment uses an LED light to lure bugs to the trap. Once inside the trap, the stink bugs are easy to rid by flushing them down the toilet. The original indoor stink bug trap from Nth Solutions is often the better option when it comes to indoor traps, since it uses both a food lure and a light attractant to lure the stinkers. When stink bugs are caught in the pool of attractant with this trap, the stink bug is encapsulated by the active ingredient and dies instantly; a nice feature for sure. When deciding which trap to use indoors, we recommend the Nth Solutions trap in your most typical, easy-to-reach areas throughout the home. When it comes to harder to reach areas or areas that are not heated (such as attics), you are often best with the Rescue stink bug trap with light attachment since it is unaffected by possible frozen temperatures and does not require as much regular maintenance. When placing stink bug traps indoors, you will see best results by keeping the traps off the ground (a table or a bookshelf are a couple of good areas for placement). It is also a good idea to limit the other light sources that are in that particle room, which might mean turning off night lights, and pulling down window blinds so that there is less competition from other light sources through the night. For further usage tips or for recommendations on what’s a good fit for your situation, see one of our experts in the lawn and garden department.